(Bloomberg) -- Huawei Technologies Co. posted a 25 percent jump in annual profit even as the Chinese telecommunications giant faces a U.S.-led push to keep it out of next generation networks. China’s largest tech company by sales posted net income of 59.3 billion yuan ($8.8 billion) in 2018 as it won customers for its smartphones and networking gear, according to a statement on Friday. Revenue for the year jumped almost 20 percent to 721 billion yuan. Despite being at the center of global scrutiny, Huawei is winning customers for its equipment as it contends with Apple Inc. for the mantle of world’s No. 2 smartphone label. The company has already disclosed accelerated growth in the first two months of 2019 as it develops cutting-edge chips and expands into cloud services. But its global prospects have been clouded by the Trump administration, which is waging a campaign to block the Shenzhen-based company from supplying equipment for the fifth-generation mobile networks. "In 2019, we are cautiously optimistic about the growth in 5G business,” Guo Ping, one of the company’s three rotating chairmen, said in an interview with Bloomberg Television. “The future of telecom industry lies in the opportunities that 5G and future generations of technologies can provide to other industries." Revenue from its consumer business, which includes smartphones, jumped 45 percent to 348.9 billion yuan while sales in the carrier unit were little changed at 294 billion yuan. Huawei said it invested more than 101 billion yuan, or about 14 percent of sales, in research and development. After years of tension and accusations that the company makes it possible for Beijing to spy on the West, pressure on the Huawei has ratcheted up. 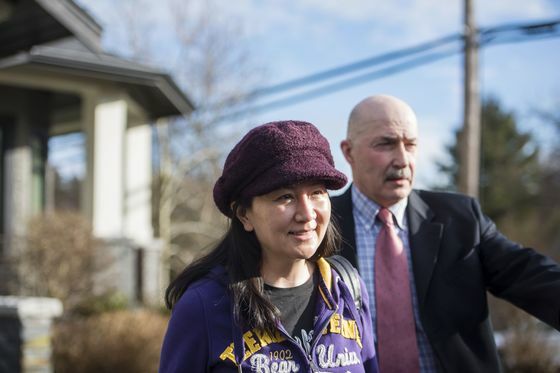 Canada detained Chief Financial Officer Meng Wanzhou last December at the behest of the U.S. Meng, also Huawei-founder Ren Zhengfei’s eldest daughter, faces potential extradition on alleged bank fraud linked to U.S. sanctions against Iran. And the Chinese company is grappling with criminal charges for intellectual property theft. Both Meng and Huawei have denied wrongdoing. Huawei finds itself in the cross-hairs of the U.S. government just as it’s pushing for leadership in 5G and countries prepare to spend billions on the potentially revolutionary standard. Still, nations accounting for more than 40 percent of the world’s gross domestic product are either embracing Huawei or appear unlikely to restrict the Chinese vendor. The company has launched a multi-pronged charm offensive to try and squelch the U.S. accusations. In recent months, Ren has emerged from media seclusion to defend his company in a round of interviews, while top lieutenants showed off the company’s technological capabilities and fought back against American criticisms. It’s also embarked on a full-blown legal offensive. In Canada, Meng sued the government for allegedly violating her constitutional rights as she was arrested. And the Chinese technology giant filed a lawsuit claiming the U.S. government is overstepping by barring Huawei from competing to supply equipment to certain federal agencies.